The Bacchanalia String Quartet were superb…so talented, entertaining and with an obvious joy and passion in their music. 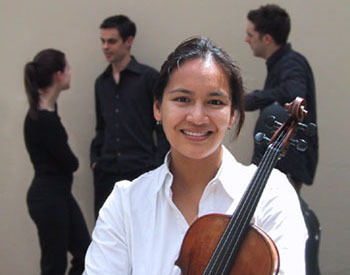 Adelaide-based Bacchanalia String Quartet was founded in 1998 of Adelaide Symphony Orchestra musicians, and has since then built an enviable reputation for great versatility, as well as for artistic excellence. Our repertoire covers an enormous range from the traditional classical Quartet repertoire, to arrangements of jazz, film soundtracks, tango and pop. In 2007 this Quartet performed at the music industry’s night of nights, the ARIAs in Sydney, sharing the spotlight with Adelaide hip-hop sensations, The Hilltop Hoods. We continued this association in the recording studio in 2009 and 2012, featuring on their albums State of the Art and Drinking from the Sun . In 2014 the Quartet recorded the soundtrack for the Australian feature film Fell . In recent years we have performed national direct broadcasts of the Franck Piano Quintet, and the Schubert String Quintet in C for the ABC. We have given concerts as part of the Adelaide Symphony Orchestra’s lunch-hour recital series, the Elder Hall Concert Series, the Barossa Harvest Festival, and for the Chamber Players of South Australia, the Adelaide Society for Keyboard Music, and the Ngeringa Arts Concert Series. In 1999 we took part in the Melbourne International Chamber Music Competition. In 2002 we performed with Rod Stewart at the Barossa under the Stars, and in 2004 we were named the new “Langbein String Quartet” and as such form the performing backbone of The Firm’s concert series. In addition to our concert and recording activities, we maintain a busy performing schedule with engagements at corporate functions, weddings, and other events.